So we're all on the same page. The differences may be subtle to guys not familiar with this junk. 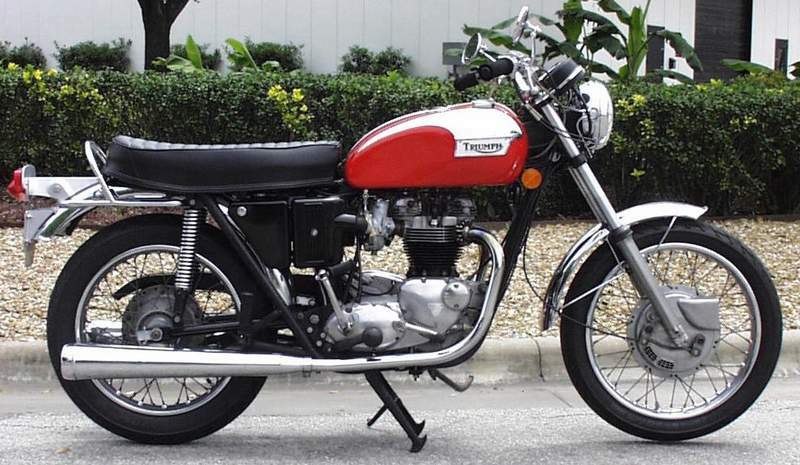 First photo is a 60's Triumph with a "dry" frame, or pipe and brazed lug.. Organic beauty like a woman..
Oh my , that '69 model is really nice . Maybe if BSA had just kept using the Burgess style mufflers and organic looking side covers , tail light , and gauges ... Oh well , all history now , at least the Bloor bikes are a success . Back in 1972 I had a fully race tuned Norton 650SS with the whole deal, clipons rear sets Manx style tank , full fairing, central oil tank, lots of weight removed, Grimeca front brake, the business. This thing clocked 132mph at Bathurst a year before I bought it. Owned by a bike fanatic Barrister , it had lots of money splashed upon it. He reckoned the motor was standard apart from a slightly warmer cam. The fastest I ever took it up to was 120mph but I was often over the ton, all round the city, one of the ultimate cafe racers. But as the bloke who had owned it warned me, it didn't like sustained high speed at constant revs. He had fitted an oil cooler because it had seized on him a few times on the track. I took it for one long ride and regretted it. I sat on about 80mph for about 4 hours and it seized on me. I was quick with the clutch as he had always been so no further damage was done. But it wasn't any good for going on trips. Vibration was not an issue, as while you were bringing that engine through it's range the excitement was enough to cause no interest in such things as vibration. It just went like stink. I believe that in this day and age, I would have had the pistons slightly reduced in size and this would have overcome that old seizing thing. Maybe. I have since owned an Atlas, renowned for the big vibes, but mine with a Mikuni was an easy starter and a lovely backwoods bike. Still I seized it too, though it had the reduced pistons in the big rebuild, and the reason was the timing could not be done correctly. Though I took the magneto to the expert, the cam that the points ran from was very badly made so that when one side was correctly timed the other side was 8 degrees wrong and advanced. This way meant it got too hot. The day it seized for the second time was the day I resolved to sell it. My wife and I just wanted to go places on a bike. Maybe we should have persevered and fitted electonic ignition, but we didn't. So we sold it and bought a Cali 3 which got us around for about 60,000k's till finally that was sold and now I have the T3. This T3 is one of the smoothest most beautiful, well the most beautiful bike I've ridden. It has more power than anything else I've ever ridden, way more than the 650, though who can say from such a distance. Still there has to be more grunt from 950 with a warm cam than a 650 with a warm cam , at least it feels that way, but I'm not here to test the limits now, I'm 62 but I was 19 with that 650 Norton so these days things just don't happen so fast. Back in the day I had a Triumph 56 Tbird which was a lumbering piece of shite, but it revved well and being a half share with a mate who also disrespected it, we had a running competition to see who could blow it up first. But neither of us managed that, so it wasn't too bad for reliability. 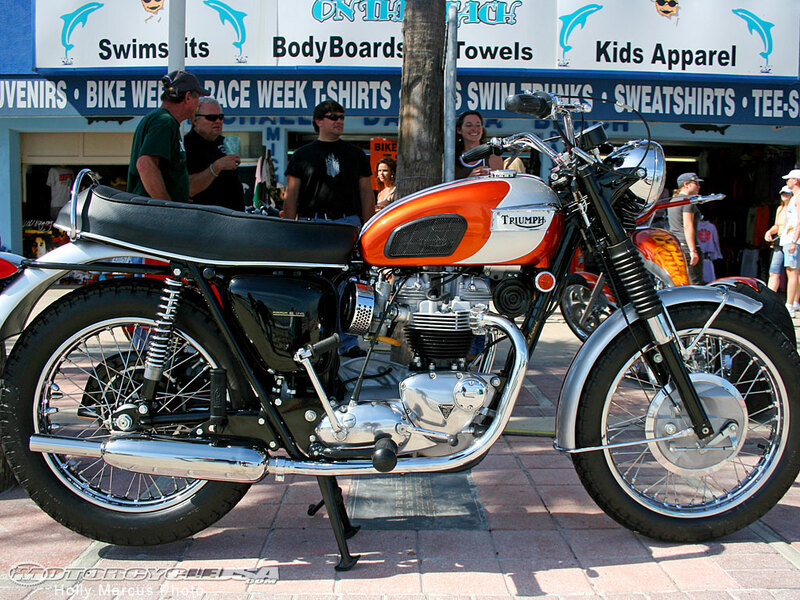 I also had a 500 Daytona that I thought was total crap. Didn't do anything that I expected a bike to do. Didn't handle. Riding on the highway you had to pull over all the time to check it hadn't shat itself because of the truly horrible tappet noise that was emitted by the alloy engine. Piece of crap. I am surprised by the sweetness of my T3 compared to the Cali though, I'd say there is a considerable difference, both in horsepower and handling. The T3 has Marzochi forks and feels totally stable compared to the old Bitubos on the Cali. The engines are probably the exact same size and the cams are supposedly both B10's but for some strange reason the T3 is a vastly superior motor. I'd say whoever built it did the real balancing job on it. It has been raced as evidenced by all the drillings of all the nuts and bolts everywhere and I'm told she keeps up with the Jap crowd, but not with me as the pilot. Anyway, a well sorted Guzzi in my humble opinion, is lightyears better than a well sorted Brit bike, nice as they may be. Then on to the V50. Felt like a big heavy modern bike. Well, it is, in comparison. lol. Smooth (and smoother than the Monza/V50 III, must be the tiny carbs and resultant mousepower). Much better suspension, don't even think about brakes -- de-linked with Goodridge stainless lines so fronts are awesome and rear is almost worthless. The next generation… but not *too* modern to have all the character removed. All good fun but metric tools sure are easier to find than Whitworth.